Asia’s leisure and investment oriented real estate market has continued to push forward throughout the region. While pricing points and unit size are shrinking or perhaps rationalizing is a better coin, the reality is that market absorption levels remain sound despite growing global economic unrest. Looking close to home Thailand’s resort island of Phuket is seeing a steady stream of incoming buyers from Southeast Asia and Greater China mostly for condominium properties. Getting inside the numbers one only has to look up and understand airlift is key catalyst. 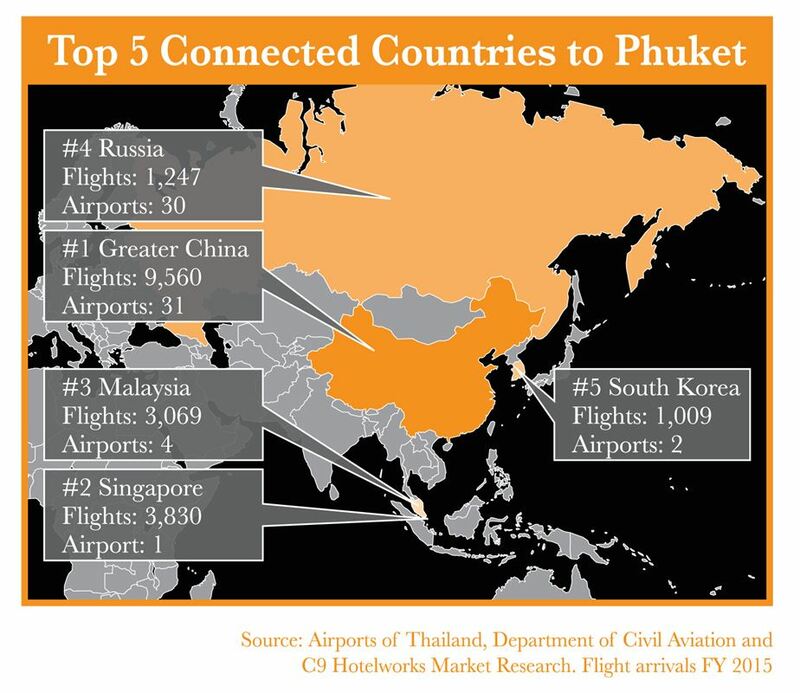 Taking 2015 as an example Greater China originated direct airline service on scheduled and non-scheduled airlines from 31 airports, and accounted for 9,560 flights. By flight volume Singapore came in second 3,830 flights and Malaysia was just above the 3,000 flight level for the year. Access to a holiday market is critical for real estate buyers who want to use properties. These could be vacation or second homes or properties in a hotel rental operation. Part of the allure of leisure property is the dream of owning a unit or house in a tropical atmosphere and the motivation is not always the money you can earn from rentals or capital appreciation but also the element of lifestyle. Working hard and playing hard equates well to Asia’s budding investors, and the ability to fly in for weekends or public holidays is an unbeatable draw card. Taking a wider view of the region and looking how airlift is evolving both from incoming low-cost airlines and emerging markets the future has clearly shifted from West to East. Phuket lies within seven or less hours of half the world’s population, hence the island as is Thailand geographically blessed. Switch over to say Bali and the ease of access becomes slightly more complicated but is not unmanageable. I was in the Island of the Gods last week and the new mantra of brokers is a rising number of Chinese buyers. Tourism continues to be the prime mover in resort destinations but the maturation and evolution of the economies is the development of a real estate sector that is able to capitalize on a core group of loyal travelers who prefer to return time and time again.